Sales, sales, sales – this was our motto during the past two months. We are glad that we may share some successes with you today. After a meeting at the National Stationery Show in New York, Mrs. Grossman's has now agreed to cooperate with us. Mrs. Grossman's is the largest manufacturer of stickers in the U.S. There could be no better way into the American market for fotovio. We are currently negotiating the price. Apart from the additional sales, however, we are mostly thrilled that the fotovio technology is now available on the American market and that awareness of the fotovio brand is constantly increasing. This week, we had a meeting with the person responsible for stationery purchasing at Karstadt (a major German department store chain) in Essen. This meeting was a huge success. As early as at the beginning of July, Karstadt will equip ten of its branches with the fotovio counter display (see picture on the right). Moreover, our contacts were really thrilled by the idea of using the stickers as advertising materials. Thus, they will pass on the idea of a joint marketing campaign within the company. Soon, we will know more about this. We are happy about so much positive feedback! We also used our stay in Essen for another meeting. A renowned advertising agency is absolutely thrilled by the business concept of fotovio and would like to support us. The customers of the agency range from companies from the tourism industry to a number of hair salons. A few weeks ago, we announced our cooperation agreement with Valora Retail. Now, the five test branches have been determined. 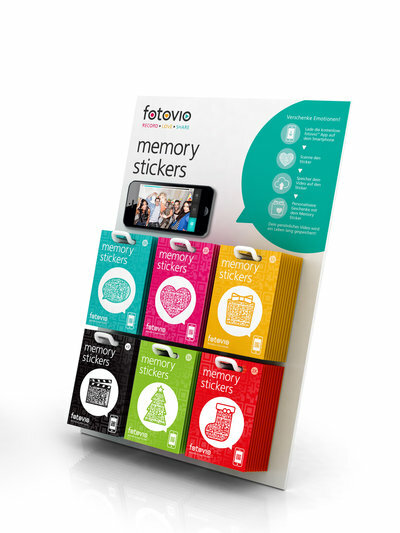 The fotovio memory stickers will be available at the main railroad stations in Hamburg, Bremen, Potsdam, and Stuttgart as well as at Hamburg Airport. If you happen to be near any of these places, feel free to support us by buying a package.